One of the perks of the pawnbroking business must be the fact that you spend a lot of time dealing with fascinating and attractive objects. The old traditionals of jewellery and watches are still there, of course, but it is amazing what people can use to raise money. Weybridge based Prestige is a year old this month, and here are some pictures of the more out of the way objects that have been entrusted to them. Are they sorry to see them go? Not so, says owner James Constantinou: “We’re here to provide people with cost-effective, short-term financial solutions. 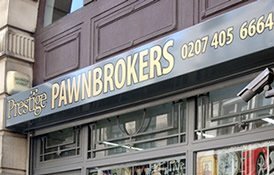 Contrary to popular belief, pawnbrokers don’t want to sell people’s goods. If someone redeems their loan, it’s a success. It means we’ve solved their problem and we have a happy customer”. Happy customers hopefully mean repeat business, so over the next year the team at Prestige will be looking forward to even more intriguing things passing through their hands. 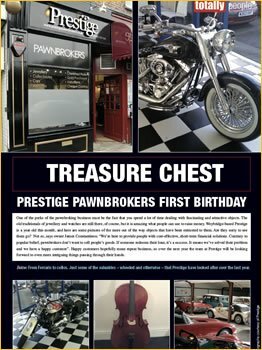 Prestige Pawnbrokers guarantee to immediately offer you a cash loan based on your item’s highest market value. We offer up to three times more cash than other lenders and gold buyers.